If you are a regular reader of this blog, you will have figured out that I am not a tour-group kind of traveler. I prefer the freedom, and the challenge, to plan my own itinerary and my own budget so I can cram as much out of a country or city in a short allotted time by my work. In my experience with tours, even the short ones I have booked once there have been unsatisfying. In Chiang Mai, Thailand we signed up for a two-day hike through the forests that involved several stops but due to time, we didn’t get to dip into the hot springs; in India, our trip to the Taj Mahal and the Red Fort was cut short because we had to stop into a marble factory for a shopping spree that would give our tour guide commission and ended up missing the entire Red Fort. In China, we hopped on a tour bus that would take us to the Great Wall and to the Ming Tombs, plus feed us lunch. It seemed like a great deal – two major sites, lunch and transportation, all for 130RMB (about $20!). Lucky us (note the intended sarcasm here), we ALSO got to tour a silk factory, a jade factory, an herbal medicine hospital (with free footrub), a cloisonne factory and attend a tea tasting. How did we climb the Great Wall (usually an entire morning or day’s event) and see the Ming Tombs (another whole afternoon), eat lunch AND see all these great other factories? Well, seeing that the tour guide gets a little commission every time someone on her tour purchases anything at these factories, you can see where the priorities lay for her. The Great Wall we crammed into an hour and a half of full ascent and descent at an entrance that is not the picturesque ones you always see. (If you climb, you want to go to the Badaling entrance, which is more touristy for a reason, and has cable cars, but is a more pleasant walk rather than a mountain hike like the one we ended up on. Take a public bus that leaves from Qian Men by Tiananmen Square, which will go to the Badaling entrance). The Ming Tombs? Instead of the dramatic greeting of animal statues and entering the dusty tomb of one emperor, we strolled around some room with a fake banquet on the table and some furniture, then left (20 minutes). After that, it was unannounced shopping, shopping, shopping, and commission, commission, commission for our tour guide. We were supposed to see the Olympic stadium as well, which we did from the bus window. Needless to say, we were all pretty peeved (but we did cave and buy some nice things, which we know are government-guaranteed, authentic products and not knock-offs found in the street markets – so no lead paint in my mother-in-law’s tea set.) In the end, we decided not to deal with the Beijing traffic bus ride home and wandered the Olympic park on our own, then took the subway back. Similarly, my aunt came across a $99 tour of the beautiful cities around Shanghai (Wuxi, Hangzhou, Suzhou, Nanjing) that included all meals, tickets and four-star hotels. However, our mornings were taken up by shopping, and afternoons driving, followed by an abbreviated rushed tour of some garden or temple or boat ride. How do you avoid this? By doing it yourself. Thankfully, China is a well-traveled country today, and there are plenty of books, signs in English, and English-speaking helpers in hotels who can help you get around. You can also shell out a little more for a private car who will take you there, without taking you to the state-run shops, and allow you to browse as long as you’d like (ask your hotel to book one and be firm and specific that you do NOT want to go shopping). You can also take a street taxi and negotiate a price, but also be firm that you do not want to stop at any shops. Additionally, I’ve heard some hostels have non-shopping journeys as well, but ask to make sure. If you do want to go shopping, don’t try to do it the same day you head to the Great Wall. We just spent two hours at a Chinese medicine clinic in the city of Wuxi getting beaten to a pulp on our backs, legs, head, face and feet while watching Chinese soap operas on the TV. In China, there’s not much mercy to be given: there is a lot of formality and politeness, and respecting of your elders and kow-towing to ancestors and all that, but when it comes to traffic, getting on elevators and subways, and getting your body massaged, there’s no politeness involved – no soft music and rose petals and effluraging of the muscles. It was genuinely one of the best massages I’ve ever had. We joined a tour group that my father found through my aunt, a $99 all-expenses paid trip for Chinese non-citizens from the US, Canada and Australia. For a whole week we’re touring through the major cities around Shanghai which are famous for being picturesque, and so far each one gets better than the next. It was through this tour we were able to arrange for the massages, though if you are traveling alone you could inquire with your hotel to set you up at one that is not going to try to sell you a bunch of oriental medicines as well. We started from the world-class city lights of Shanghai to the beautiful city of Hangzhou famous for its West Lake with pagoda vistas and cherry blossoms, to Nanjing with its rock gardens, Purple Mountain and ancient city wall, to Wuxi with its giant new Buddhist temple and the enormous metal Buddha standing in the hills. Before this, Jon and I jetted down to the glamorous and rising star city of Guangzhou where we became the country folk, craning our necks to look at the tall, space-age buildings forming the new skyline. Like Beijing and Shanghai, and much of China, the cities are building so fast with some of the tallest, most elaborate and forward-thinking designs in buildings that there’s no question that China will become the most advanced and powerful country in the world, within our lifetimes. Jon is antsy for his computer back so I will sign off. Til later! View of Wanchun Pavilion at the summit of Jingshan Park, as seen from the Forbidden City. 14 flying hours later, 12 hour time difference, we’ve arrived in Beijing – the city that’s ever-changing, where the concept of self-consciousness went out the window with Communism. Ideas like waiting in a line for your turn, allowing people to get off the subway before getting on, or not pushing don’t quite exist, nor does picking your nose, hocking lugies and other gross behavior (however, only older men seem to be doing this). However, in this state of non-self-consciousness also comes a personal freedom, in which people go to outdoor dance classes and dance by themselves without a care in the world, where people aren’t shy to try something new and look stupid doing it, where they wear what they want and show true enthusiasm for something they like (“your child is so pretty!”) and true honesty when they don’t (“you look like you’ve gained a lot of weight”). It’s what happens when capitalism meets communism, and it’s a refreshing change from the artificiality and politeness and white lies we deal with back home every day. 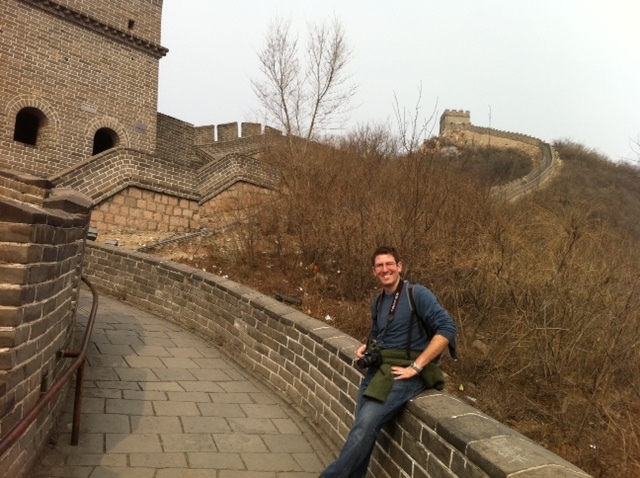 On the rest of our itinerary: a couple parks built in the 1200s, some shopping, and of course, the Great Wall of China. Then we’re off to Guangzhou, then Shanghai. To be continued!